So. Why do I even need to be at the top of Google? Some interesting statistics for you (thanks to Search Light Digital!) from a study involving nearly 37 million searches, highlighting the percentage of clicks each natural search result is likely to get. It’s important to be at the top. As seen from the statistics, if you're not in the top 3 results, you’re not going to get many click-thoughs. Do bear in mind though, that the search term can be specific e.g. geographically. 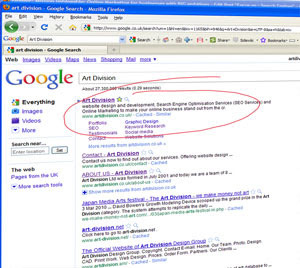 For example, Art Division is in the top 3 results for “website design Wimbledon”, and even though we’re not in the top 3 for the key phrase “web design”, we still get lots of search engine traffic! Search engine optimisation means optimising the content of your website, for the relevant keywords you wish to be found for in the search engines. Here it’s great to get the opinion of a professional – this can make all the difference in your search engine success – they’ll be able to give you individual advice on the appropriate keywords/ phrases you should be optimising your site for. Read more in our post about selecting keywords. Consider how your result will be displayed. Shocking statistic: almost 50% of searchers in the study did not click on any result at all! This really highlights not only the need to appear at the top of Google, but also need to consider how your result will be displayed. Let’s have a quick look at how to optimise the appearance of your result. - This needs to describe clearly and accurately your page and/or website. - So make sure it is interesting + relevant ! Being at the top of Google today doesn’t mean you’ll still be there tomorrow! The best strategy? Update your site frequently with brilliant content. Not only will visitors want to come back, but they’ll also want to link to your site.